A great favourite with professional chefs and keen home cooks, the king scallop has a sweet, delicate flavour and meaty texture. It’s abundant around Scotland, where it lives down to depths of more than 100m. King scallops can grow to 17 cm across, and live for up to 20 years. At Macduff, we prepare and supply king scallops as whole shell, half-shell and meat - fresh or frozen. Queen scallops are a different species, not just little specimens. They’re much smaller than king scallops, growing to about nine centimetres when they’re between six and eight years old. They’re found all around the UK, with the main fisheries in the Irish Sea and English Channel. We produce queen scallops as whole shell, half-shell and meat - fresh or frozen. King and queen scallops have different habits, so we use different gear to catch them. King scallops tend to bury themselves into the sand when they’re disturbed, so we use a spring-loaded dredge - known as a Newhaven - to rake them up from the seabed. Queen scallops are more active swimmers and are normally caught using towed fishing gear. 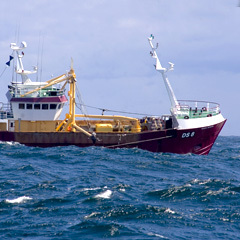 At Macduff we operate our own vessels - in fact ours is the largest scallop fleet in Europe. The boats have been specifically built and equipped to fish only for scallops, and they allow us to fish in a controlled, targeted manner. This ensures a more reliable supply of top quality wild scallops, and a responsible, sustainable harvest. At Macduff we meet the boats at the quayside to ensure the scallops get to our processing plant as quickly as possible, and with the minimum of handling. Once they arrive at Mintlaw, they’re washed, opened and shucked by our highly-skilled staff, leaving pristine nuggets of beautiful scallop flesh to be packed fresh or frozen. The process for queen scallops is almost the same, although much of our queen scallop product is packed and sold without the orange ‘coral’ or roe. Our main processing plant at Mintlaw is just ten miles from the biggest shellfish port in Europe. King and queen scallops are not subject to TAC or quota restrictions. The fishing fleet is subject to controls on fishing effort, designed to restrict the number of boats in the fishing fleet and the number of days boats can spend fishing. There are also technical measures designed to cover how and where boats can fish. Under the CFP, technical measures include minimum landing sizes, minimum mesh sizes for nets, closed areas and seasons, limits on by-catches, requirement to use more selective fishing gear and measures to prevent damage to the marine environment. For best results, place desire amount of scallops on a thick layer of paper towel and let defrost in the refrigerator overnight. For quick defrost, place the sealed bag in cold water for 30 minutes. Remove scallops from the bag. Drain. Do not rinse. Gently pat dry. Pan Seared: Heat one tablespoon of oil in a pan over medium heat. Season defrosted scallops with salt and pepper and add scallops to pan counter clockwise one by one. Be careful not to overcrowd. Sear for two minutes then flip in same order. Sear for another minute; remove heat and allow scallops to rest in the pan for one minute. Frozen scallop in the whole or half shell. All products are available in a number of pack sizes to suit customer and market requirements.